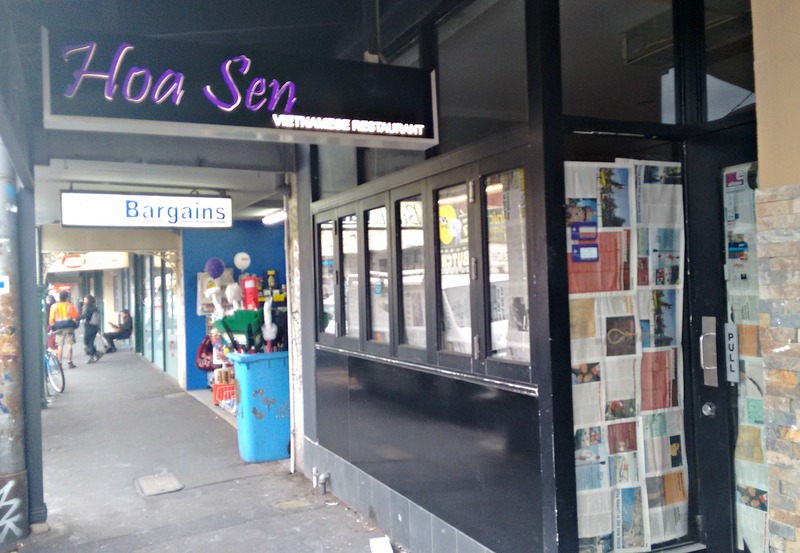 The premises that housed the now-closed Nando’s outlet on Anderson Street in Yarraville is to be a Vietnamese eatery. The windows remain papered over but the signage is up! 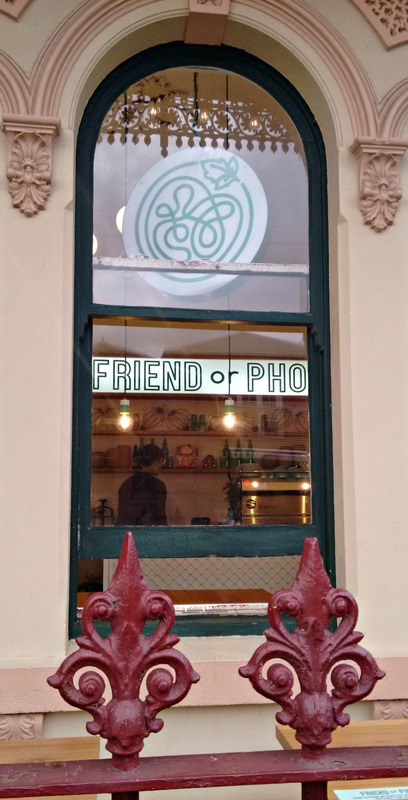 Around the corner on Ballarat Street, the wonderful Friend or Pho has extended its opening hours. 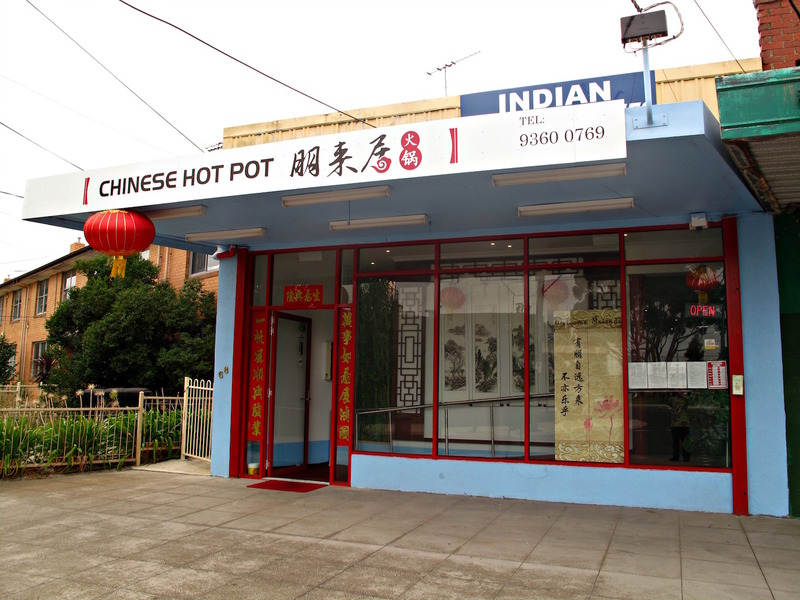 It’s now open for lunch and dinner on Thursdays, with Wednesday the only non-opening day. 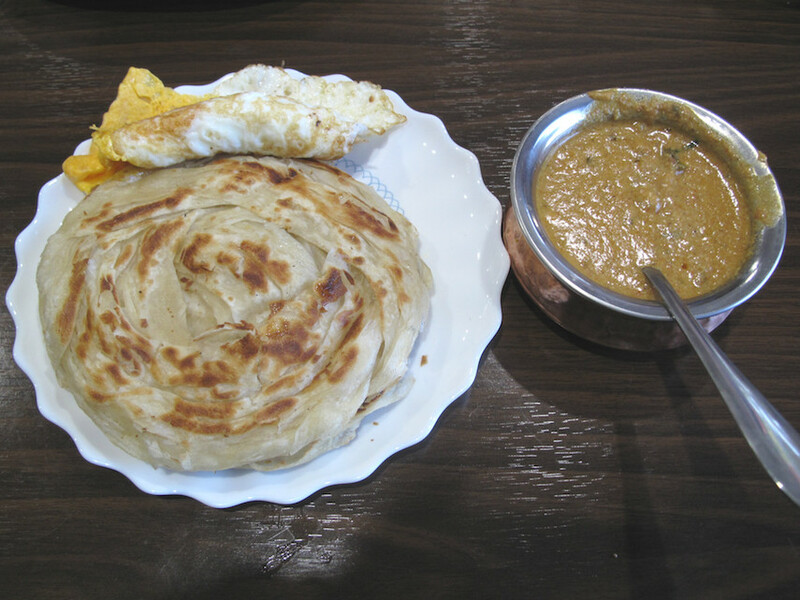 Over in Brooklyn, Dosa Palace is open at 28A Millers Road. 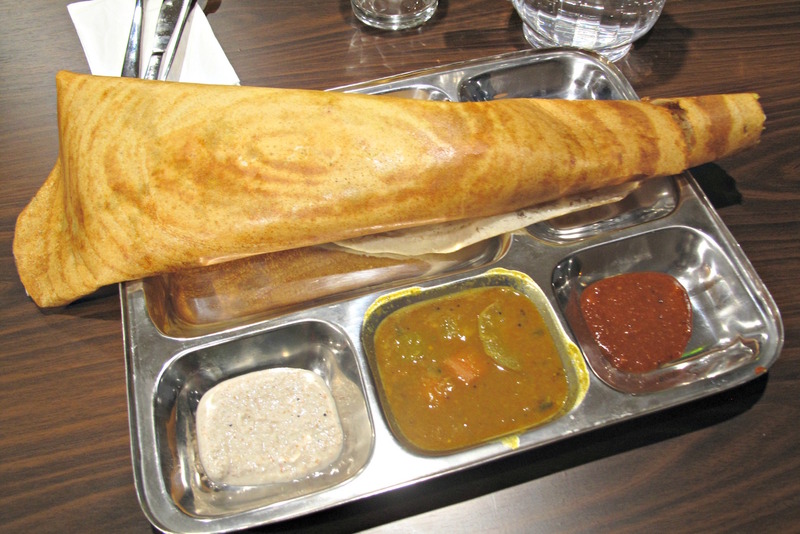 I dropped in on opening day for a very nice masala dosa – the potato stuffing was particularly memorable. Unlike its WeFo sister restaurant, Hyderabad Inn, it’s a low-key cafe-style place but will, I’m sure, do the locals just fine. 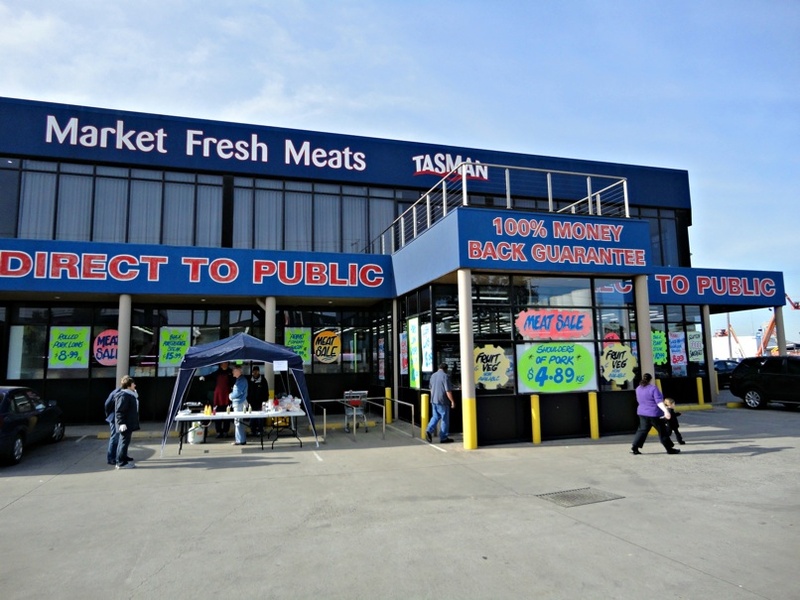 The last time we hit Tasman Market Fresh Meats in Brooklyn, it was a warm/hot summer day and we pretty much froze in the chilly interior. It was just like shopping in a freezer. 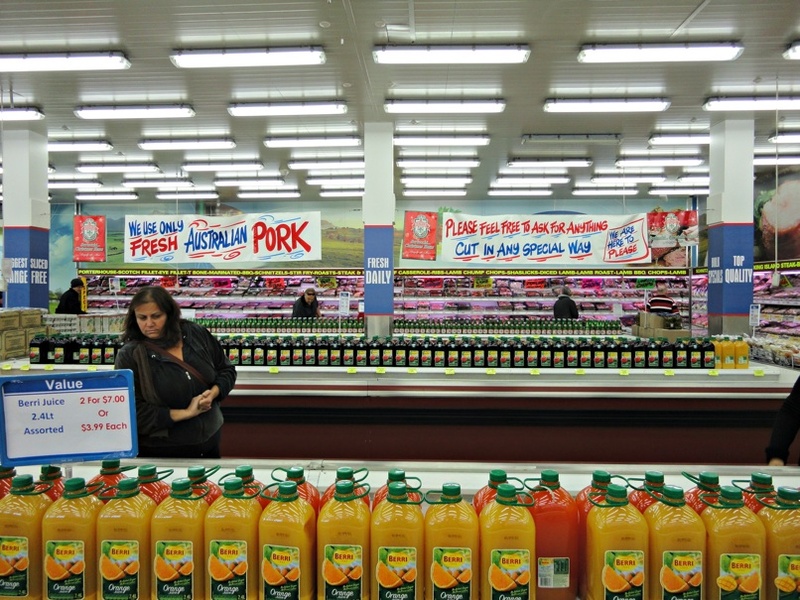 In fact, doing business here IS shopping in a freezer, such is the quantity of chilled and frozen produce on hand. 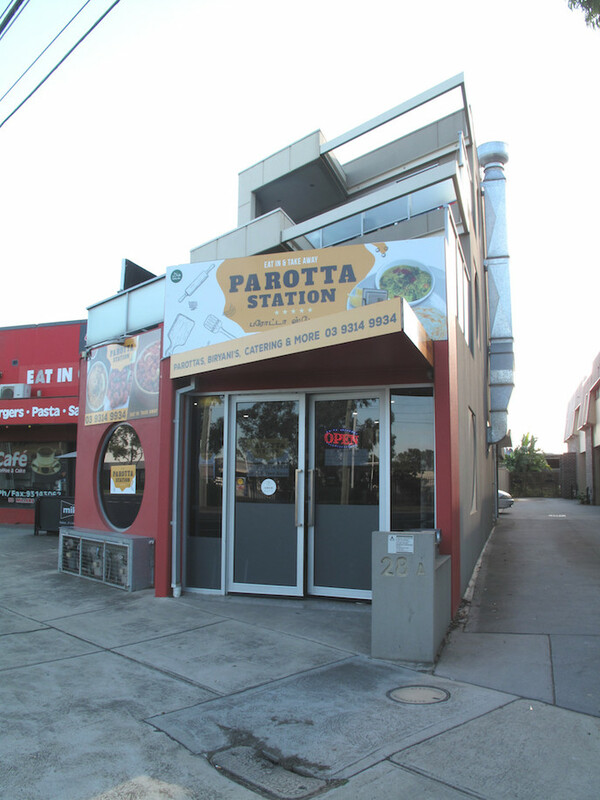 On that day, we couldn’t muster enough of a shopping list to breach the $20 EFTPOS limit, so left empty-handed. 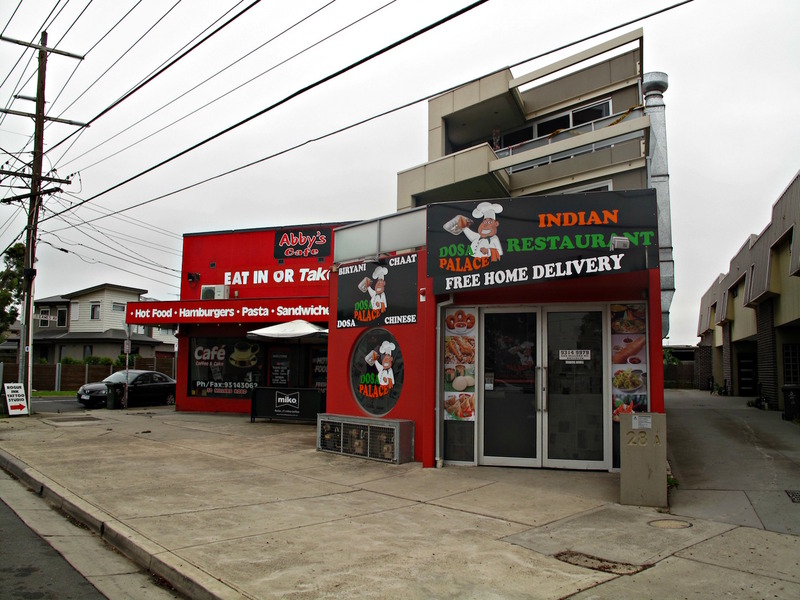 We suspect this is the sort of place more suited to larger family units than our two-person show. 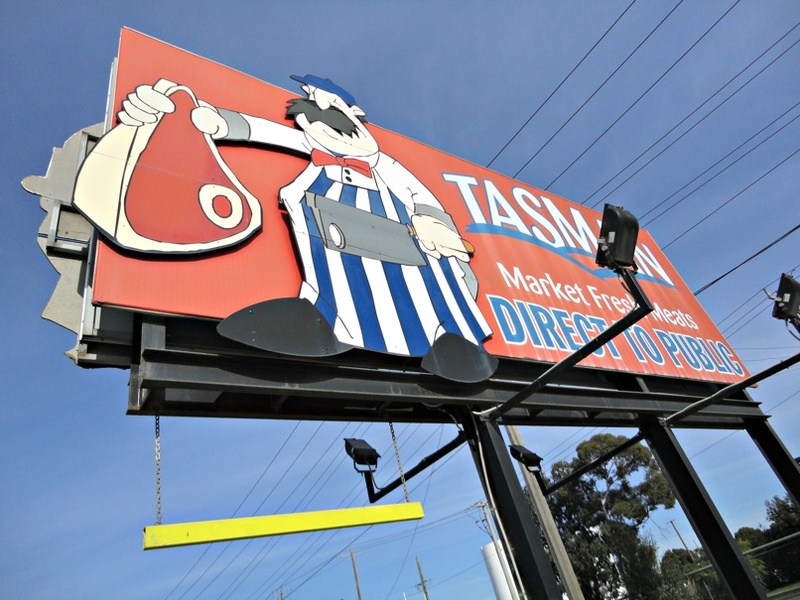 Nevertheless, today Tasman happens to be on our route home from that morning’s rugby match and we are happy to stop and shop. 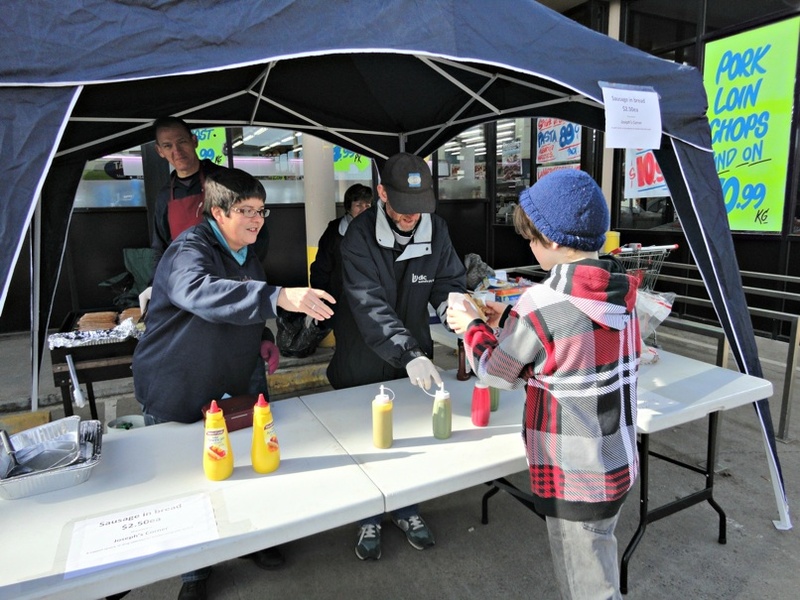 As well, the snag stand outside does fine duty in providing Bennie’s post-match snag – with onions, BBQ sauce, $2.50, thank you very much. It’s a sunny Saturday morning but still very chilly, so the temperature seems the same inside and out! We wonder if we’ll see any meat derived from the notorious “it’s raining sheep” incident of a day or so earlier and a few kilometres up the road! Our meat-eating tends to be a matter of moderation and spontaneity inspired by both temperament and restricted fridge and freezer space. 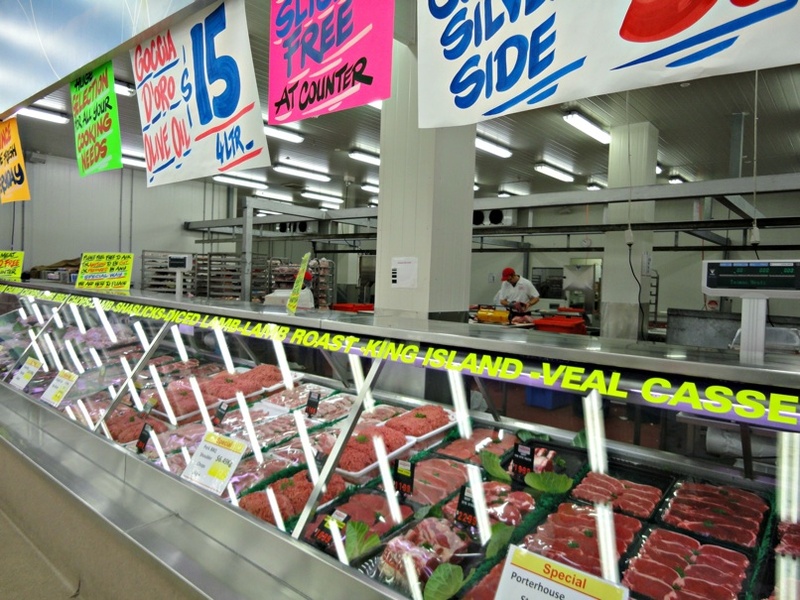 So unlike most Tasman customers, we’re not here for the meat – though there is a whole lot of it. 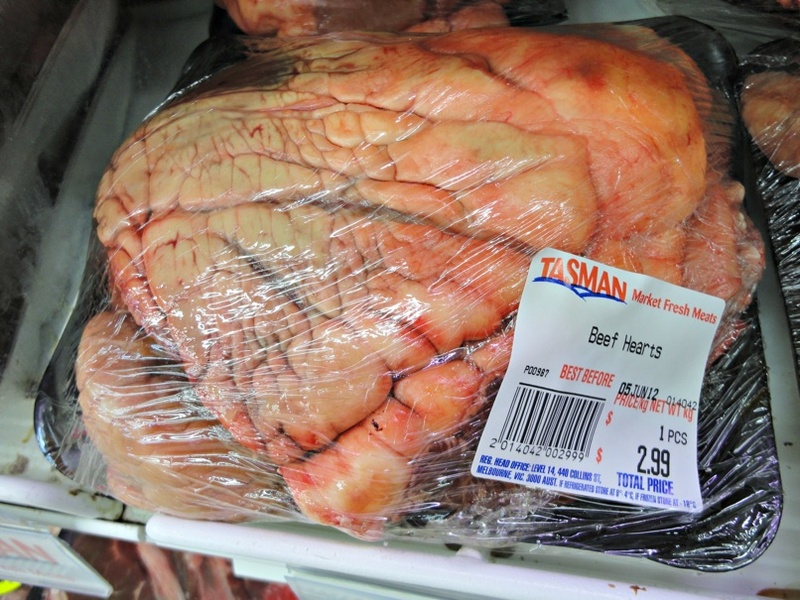 There’s even a fairly extensive range of offal, but how the prices compare overall to other outlets and markets is difficult to gauge. 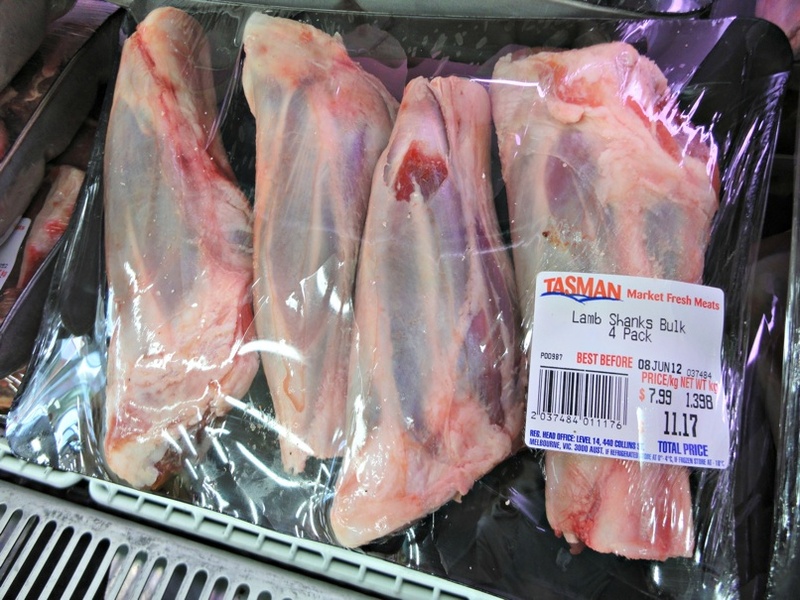 The lamb shanks, for instance, don’t seem any cheaper than anywhere else. 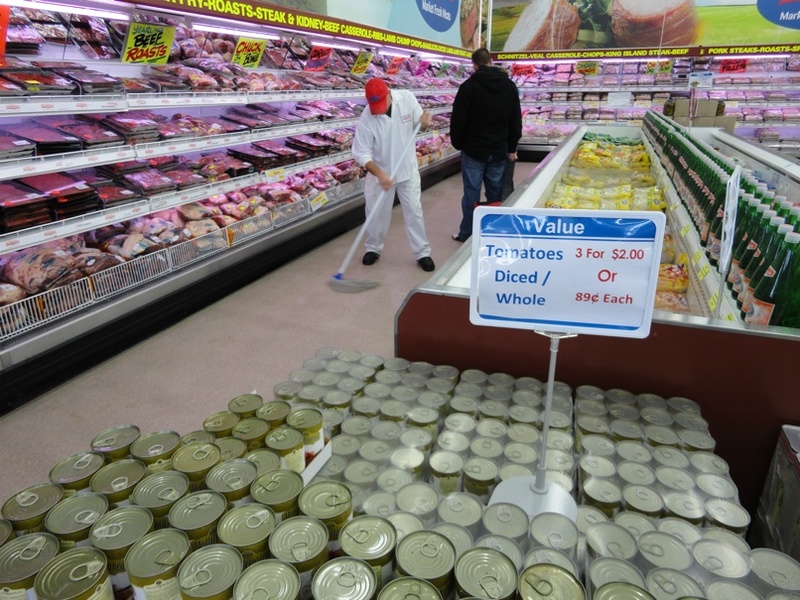 While there is a vast amount of plastic used in packaging here, the signage and the butchers on hand make it clear the service can be more customised and flexible than may at first appear to be the case. 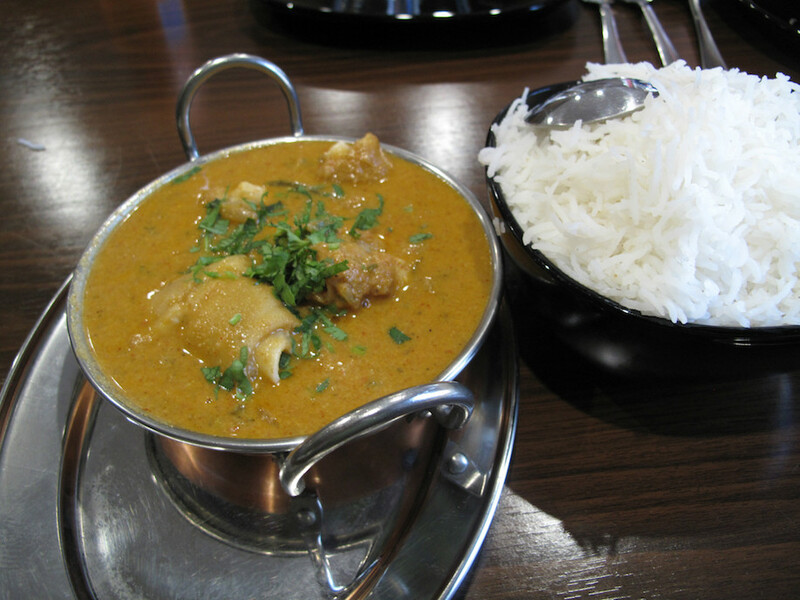 We know someone who loves this stuff, and we no doubt eat enough of it ourselves on our periodic visits to charcoal chicken shops, fish and chip joints and the like. But ours is not a mindset that would see us actually toting bags of the stuff home. 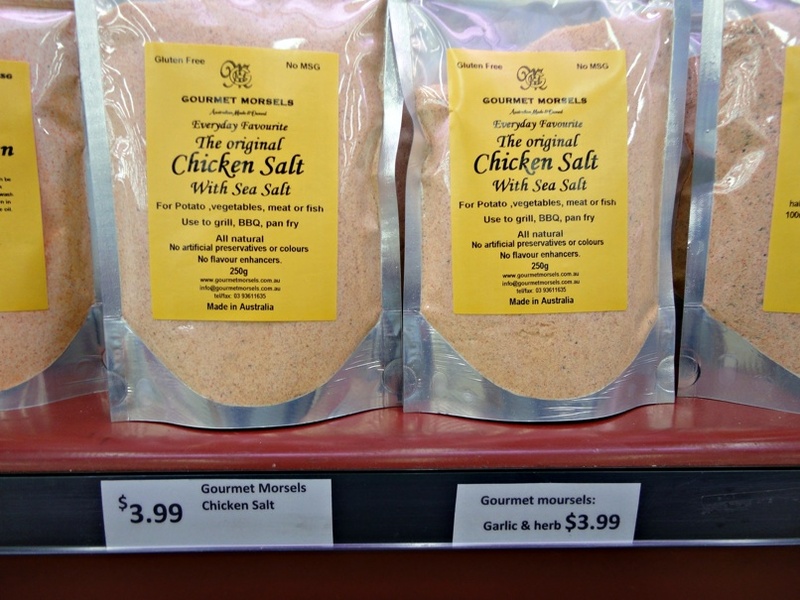 The best bargains we spy – and those that go in our basket – are of the dry goods variety. Three cans of Mediterranea canned tomatoes for $2. 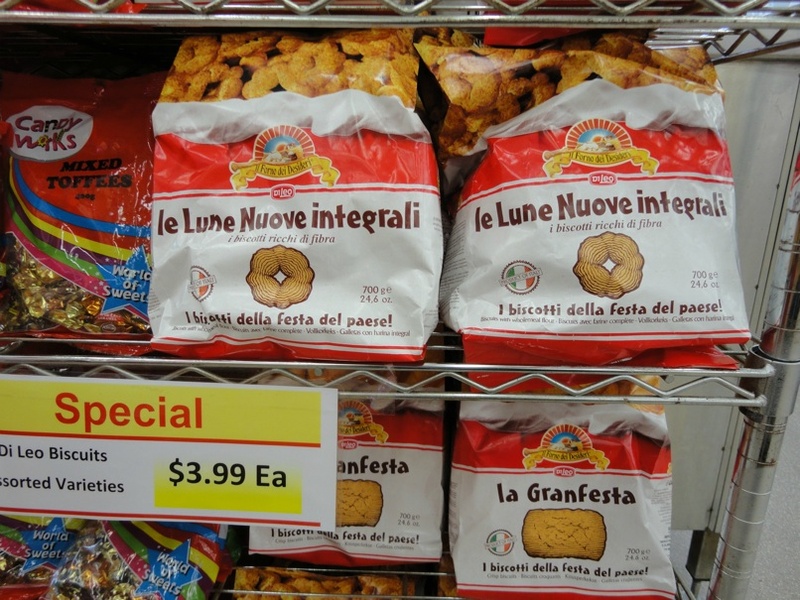 The big 700g bag of Le Serenate biscotti provides low-rent crumbly cookies, but still fine for school/work lunches. Two packs of pasta for 88 cents each; some cheap olive oil for cooking so we don’t use the good stuff for same; some hot chilli pate just for fun. Bennie and I have struck deal about the breakfast standoff – he’ll give the bought cereals away and eat the same as dad, just so long as dad does away with the white sultanas (“white maggots”) and uses other dried fruit instead for the muesli. So we grab almonds, dried apricots and dates to join the oats already waiting at home. 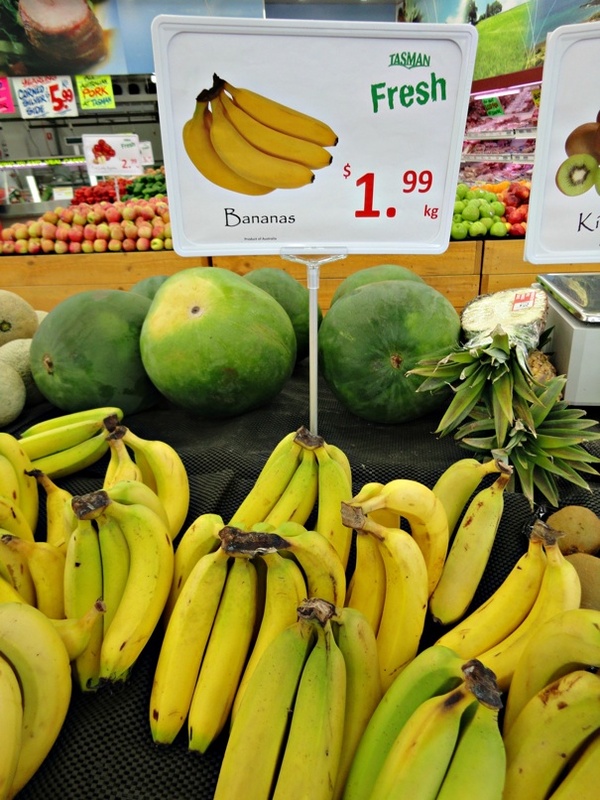 We don’t recall – from previous visits – there being fresh produce here. Truth be told, the Tasman range is not much more than basic, but does the trick I dare say for those wanting to cover their bases without making another stop on the way home. We pick up an armful of bananas, some sweet potatoes, a $1 bag of mandarins. 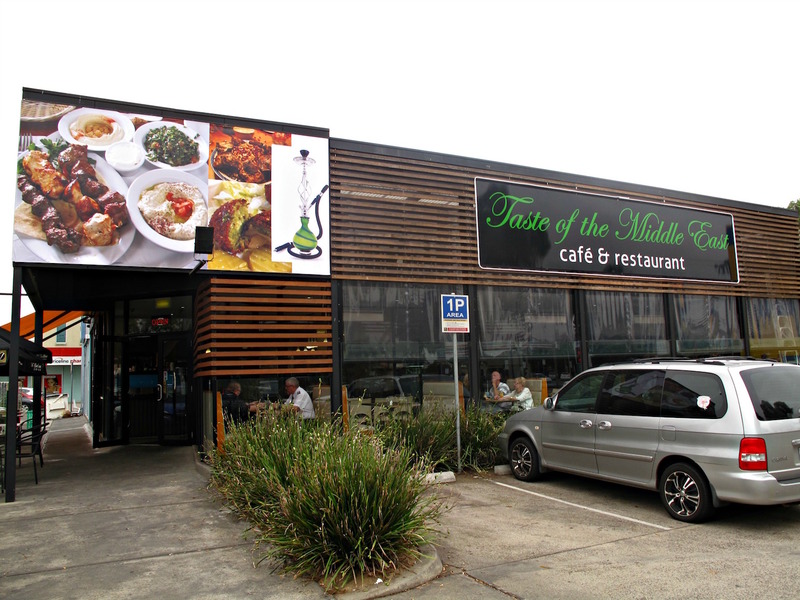 It’s a little out of the way for us, so Tasman is unlikely to become a regular haunt. But it’s been just the ticket today for us in a $37 shop that has set us up for the rest of the week. 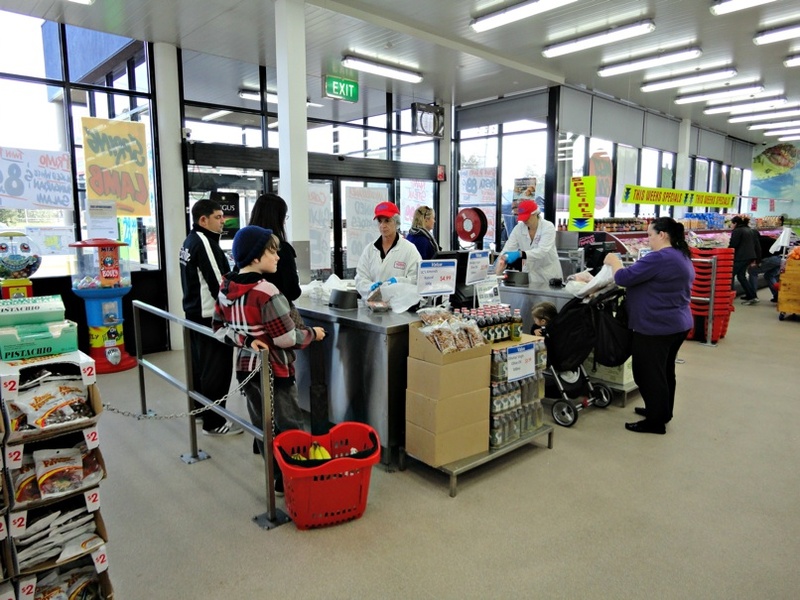 As we leave, Bennie opines that it still seems more like a butcher than a supermarket. And they don’t stock coffee.